Pip Payne is convinced New Zealand needs more prefab homes. Like housing minister Phil Twyford, he can't see a credible solution to the housing crisis that doesn't involve factory-built homes turned out at a rate that traditional building techniques can't match. The old "stick-built" method of building is just far too slow, and costly, and too often poor quality, Payne believes. Pip Payne opted to build a prefab house made in a factory and assembled on site. But unlike Twyford, who is spending taxpayer money on KiwiBuild, Payne is putting his own money into raising a prefab home on a "sand dune" on Wellington's Kapiti Coast. Twyford says prefab homes are essential to making KiwiBuild work, though few now expect the minister to deliver homes as fast as he hopes. 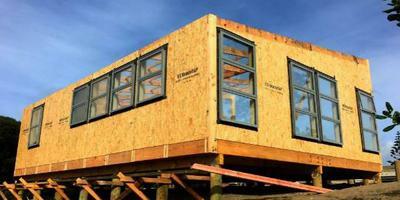 Pip Payne's prefab house is rising on a Kapiti Coast sandune. The idea of a ramp up in prefab activity, and the expansion of New Zealand-based prefab factories, has brought mixed reactions. Some recall past generations of cold, drafty, damp prefab homes, and fear a new wave of them rapidly becoming high-maintenance, poor-quality dwellings like those that went up in the 1970s and 80s. Supporters of modern prefabs say quality has been a dreadful problem in traditionally "stick built" properties, citing defective apartments and leaky homes that have cost owners billions to fix. Pamela Bell, chief executive of Prefab NZ, is working with banks to ensure Pip Payne's easy route to financing his modular home's construction is replicated time and again. Prefab technology has moved a long way since the 1980s, they say, and there's many in the industry who want to draw a line under the past by ditching he term prefab entirely, and instead using words like "modular" housing, or "off-site construction". Payne's decision to have his home pre-fabricated in the Masterton factory of EasyBuild, a New Zealand company currently turning out a house a day. It wasn't his original plan. Like many he longed for his own architecturally-designed dream home.